In the morning we had a long reflection about the project, our experiences, thoughts, and what we learned. Needless to say, it was quite an emotional discussion. After breakfast we went back to face the market. This time we all had our lists ready of what we wanted, and knew how to somewhat bat off the shopkeepers. I had Emmanuel come with me to make sure I did not get ripped off. I tried my best at haggling — starting at 1/3 of the price and then only rising to pay at the most, half. I got everything I needed in the nick of time. We had our last supper at Flames again, but this time we were able to eat outside. I had my final order of Red Red (can’t get enough!). Derrick surprised us with our last order of ice cream, but this time it was chocolate covered ice cream bars! I always felt like Derrick was picking up the check, but in reality he just had all of our money and spoke to the waiters in Twi. Back at the hotel we packed up all our things. Derrick, Chief, Emmanuel, and Ma Tess presented each of us with a dress and a bracelet. Once again, we were surprised. They have done more than enough for us and gifts were not necessary. We, in turn gave our gifts to them and Leila gave them their tips. I could not fathom tipping someone who has been a part of our family for the past two weeks. How much is too much or too less? I’m glad I did not have to take care of that part. After our gift exchange we bid farewell to the beautiful Ma Tess and drove to the airport. We first checked our bags and then came back outside to say goodbye to Emmanuel, Chief, and Derrick. It was a tearful goodbye. As Emmanuel said, all good things must come to an end. Our flight left Accra at 10:45pm, arrived in London at 6:25am, and arrived at JFK at 11:30 am. I was incredibly confused about the time difference and what day it was. I finally got the hang of it once back on Long Island. This was the most amazing experience I have ever had. I feel honored to be part of such a project and I hope to come back soon…Just need to fundraise! 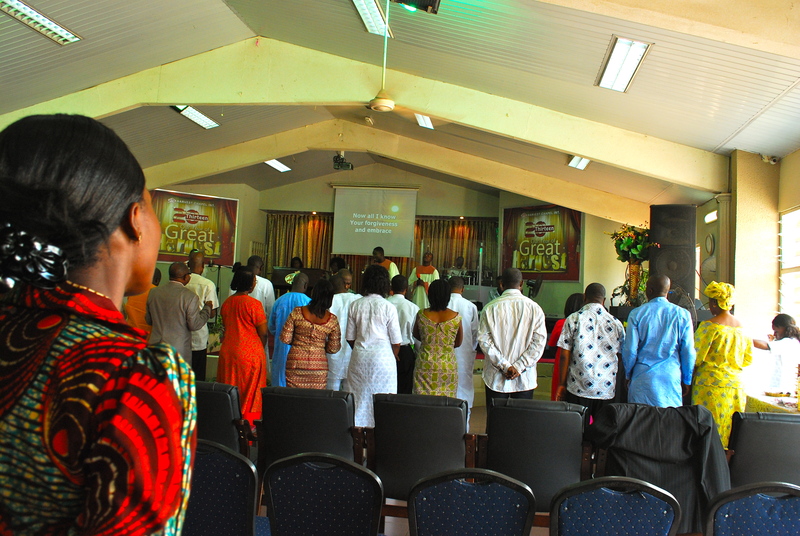 On this day of the Lord, we went to Derrick’s home church, Harvest Chapel International. The church is a Charismatic Christian church, which emphasizes the Holy Spirit. There was a lot of singing, dancing, yelling, and clapping. It was interesting to compare Harvest Chapel to the Presbyterian church of Worawora. Harvest Chapel clearly was wealthier than the Worawora church. There were 2 projector screens displaying the lyrics to all of the songs. The overzealous energy of the worshipers was a bit intimidating. After mass we went to the market. Nobody was prepared for the craziness we encountered. The second we pulled into the market, men surrounded the car waiting for us to get out. Each man wanted us to see their shop. “Free looking” they kept repeating. One of them heard me say, I wanted a backpack, waited until I was finished looking around and said to me, “Come to my shop. I have the backpacks. You’re friends are there.” When I got to his shop, there was just another obruni. I laughed. Just because there was another white guy in the market, everyone assumed we knew each other. I ended up not buying anything that day because I was too overwhelmed. We stayed at the market for an hour or so and then went to have lunch with Derrick’s uncles (the ones we met in Worawora). Uncle John’s neighborhood reminded me of a residential area in Florida. When we pulled up to Uncle John’s home, there were two big tents in the courtyard, speakers, a dj, and a bunch of seats. We realized that they were throwing a party for us to show their thanks! John got on the microphone and greeted everyone. In typical fashion before any Ghanian family gathering, they say a prayer and sing the National Anthem. We then were invited to sing the United States National Anthem. After our singing, John got on the microphone again and said, “BRING OUT THE PIZZAS!” We all had a slice! It was delicious, much better than the pizza at Flames. We gave our deepest thanks to Derrick’s uncles and told them none of us were expecting any of this. I thought we were just going to have a casual lunch! 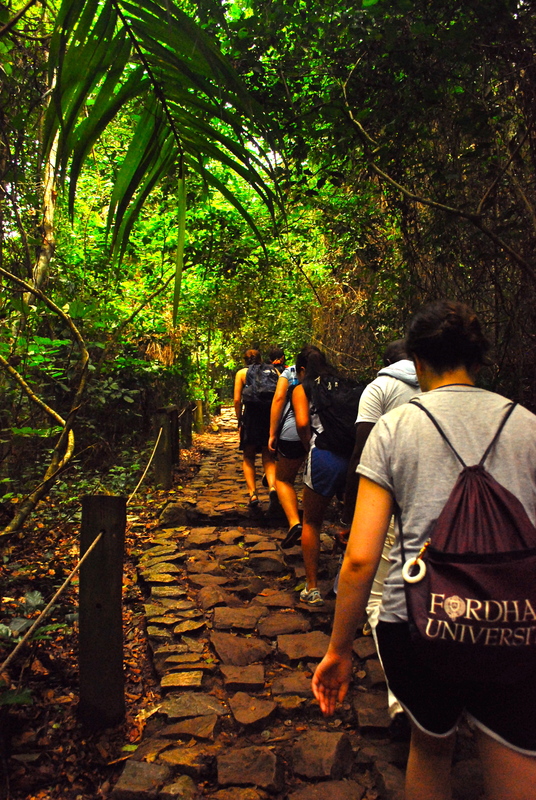 There were several options in case one got scared, but our entire team braved the 1,150 foot long walkway! 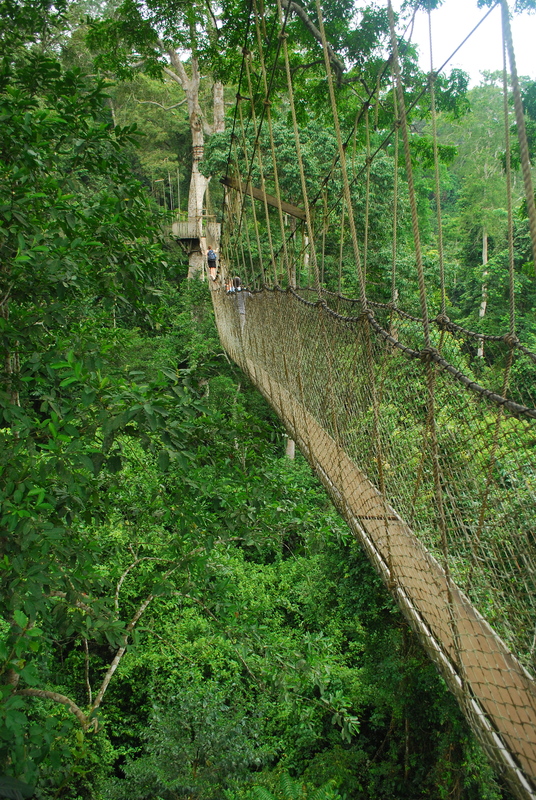 The canopy walk is 40 meters from the rainforest floor and connects to 7 tree tops. I thought I was going to be more frightened to walk across, but I was fearless. Before I knew it, I was already at the end of the walkway. I wanted to walk back the other way! I was sad we did not see any animals, that would have made the experience even more perfect. We ate lunch back at the botel (I had rice, beans, and chicken). 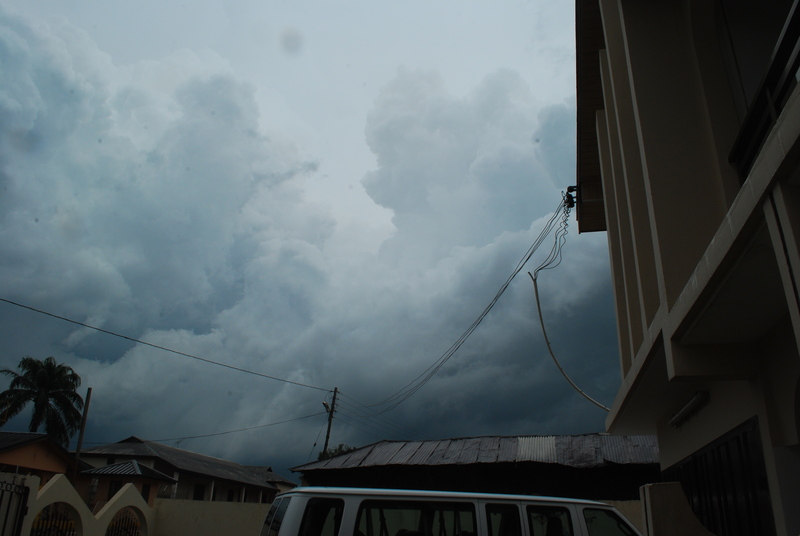 We drove back to Accra through a lot of rain. It was not raining in Accra, until we left to go to the restaurant. Mother Nature decided to start a huge thunderstorm. Nevertheless, we hopped in the van and drove to the restaurant, Flames. If it was not raining we would have sat outside. We all had pizza, which was not anywhere near as tasty as NY pizza — still, it was nice to eat something other than chicken and rice. When we went back to the hotel, we were finally able to reflect on our past two days of traveling. Although being in Accra was a nice transition before we went home, I truly missed Worawora. On Friday, we awoke in Accra at the Mascot Hotel. We drove about an hour and a half to Cape Coast to visit the castle. 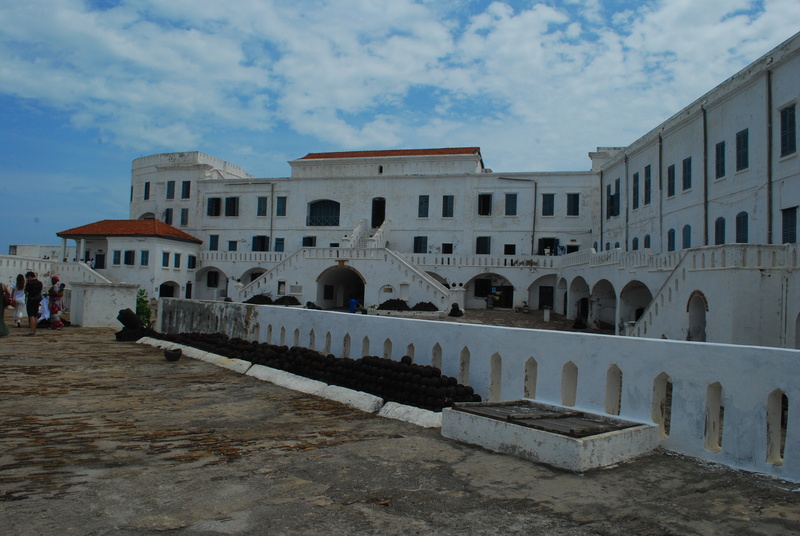 Cape Coast Castle is one of Ghana’s many slave castles. Originally built by Swedes for timber and gold trade, the castle was used in the trans-Atlantic slave trade. Control of Cape Coast passed on from the Swedish, to the Dutch, and then finally to the British. It is a beautiful building with such a horrible history. A tour guide took us around the castle and gave us the history as we entered the male and female dungeons. 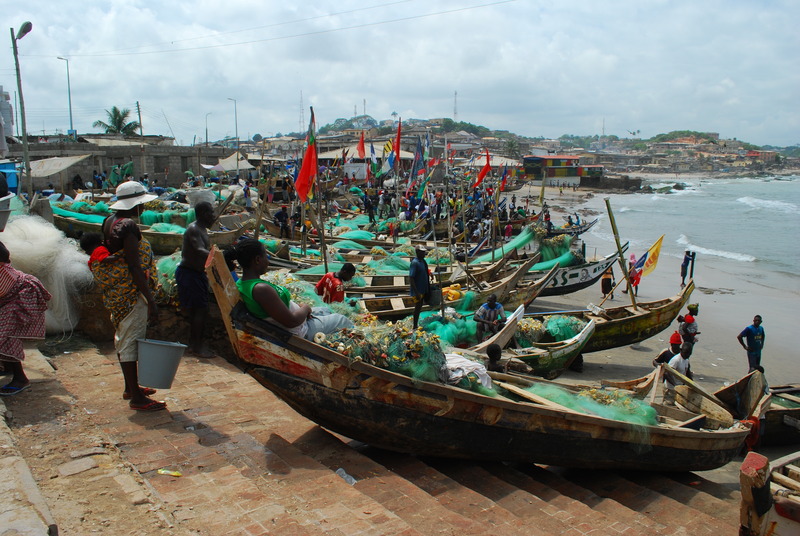 Similar to Aboatase, Cape Coast is a port city. We took a peek at the fishermen behind the castle walls on the shoreline. 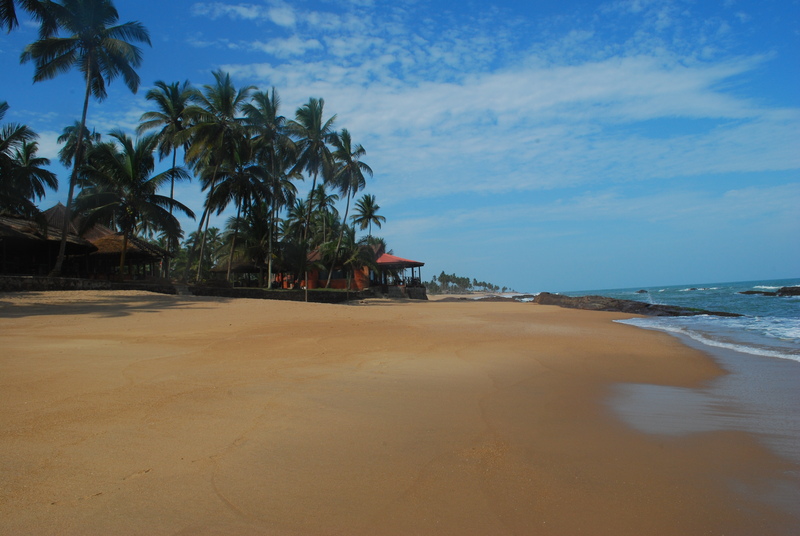 After the tour we drove to a neighboring village, Elmina. Much to our surprise, we ate lunch at a very fancy beach resort, Coconut Grove. We ate like kings! I had a delicious meal of prawn and fried rice. I still missed Ma Tess’ cooking though. After lunch some of us swam in the ocean. It was so lovely! After our week of working, it was nice to relax a little on the beach. 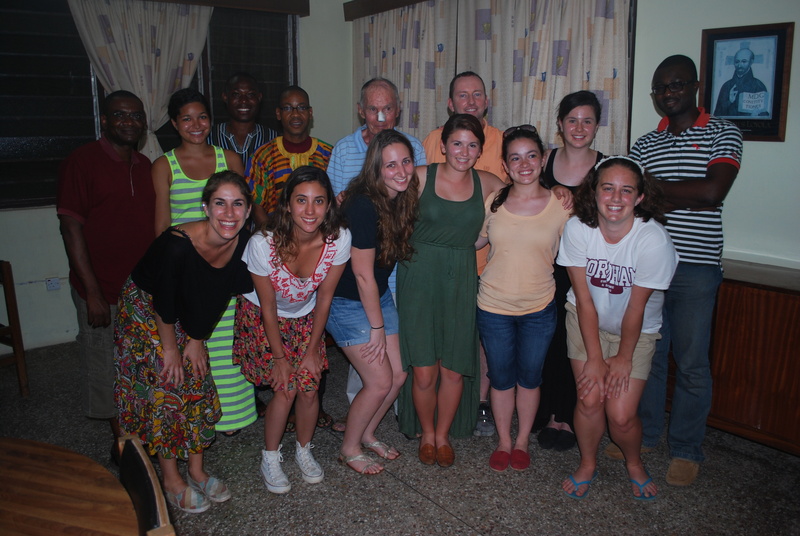 We later paid a visit to the Jesuit community of Cape Coast. We met Father Raymond and Father Don. Father Raymond is a Ghanian, who works at Cape Coast University and is also the Superior (even though he is much younger than Father Don). Father Don grew up in the Bronx and became a Jesuit in the 1950s. He has been in Ghana since 1992 and teaches at the Seminary. It is just the two of them living in their house! I asked if they play games together, and they both laughed. I bet they get hammered on occasion. Father Raymond said he has a lot to learn from Father Don, so when the two are together after their busy days, they have long chats. After leaving the Jesuits we drove to our hotel — Hans Cottage Botel. Why it is called a Botel I will never understand. It is built on a swamp, but I didn’t see any boats… quite a bizarre place. We woke up bright and early at 6:45am, ate breakfast and were out the door by 7:45am. We mixed more mortar for the smooth layering on the floor and completed it! We moved bricks once again across the huge field so the masons would have them at the ready after we left. Before we left we etched “GO! 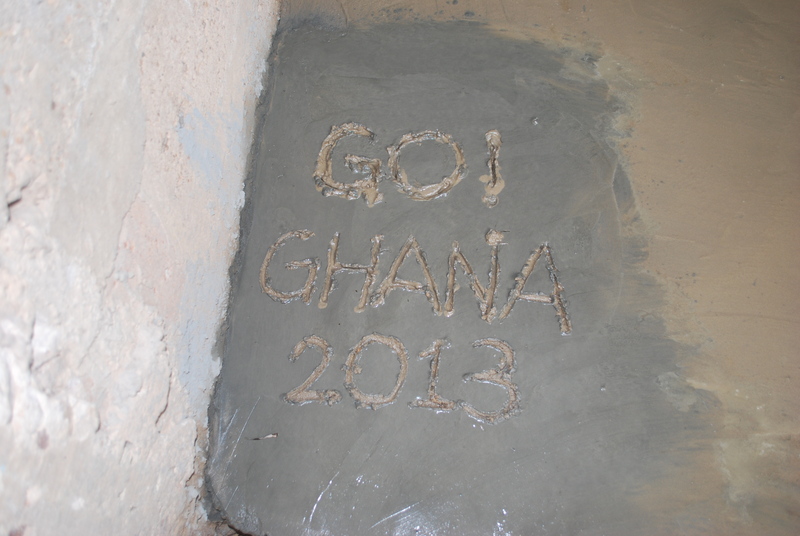 Ghana 2013” on the floor near the doorway. It was sad to say goodbye. All the children kept asking us for various things — “Give me your backpack, your shoes, your shirt…” They even asked me for my hair clip, and they don’t even have hair! It was a little uncomfortable having them ask us for things. 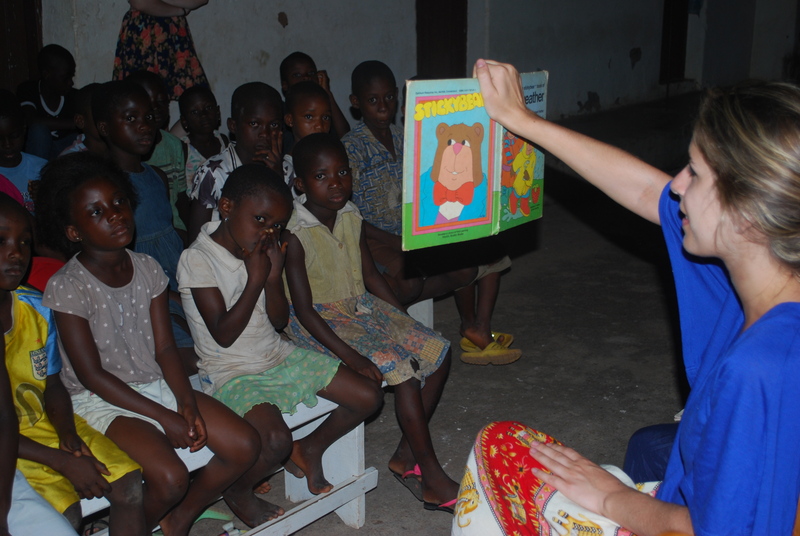 I really enjoyed working alongside the locals and also having some down tie with the children. The Head Master of the school gave us her thanks and blessings. I started to tear up. We all felt honored to be part of such an amazing project. Before I left, I gave one of the masons my sneakers. He was the oldest one on the team — a very skinny man, who looked like he was always about to keel over, and yet he was as strong as an ox. I walked back to the house in my sneakers and then gave them to a little girl who was to bring some other things back to the site. I stuffed a pair of clean socks and sent them over to Mike the mason. As we started walking home it started to rain. We ate lunch, showered, and shoved off to Accra. It was as if all of Worawora was crying. Chief had his Celion Dion CD on in the car, so that certainly did not help with our heavy hearts. Our drive to Accra was in a continuous thunderstorm. For the entire 5 hours it was raining. Towards the end of our drive, we added an additional 1.5 hours as we were stuck in stand still traffic. We stayed at another Mascot Hotel. It was a shock to have running water! What a treat! At that point anything seemed fancy after living simply. 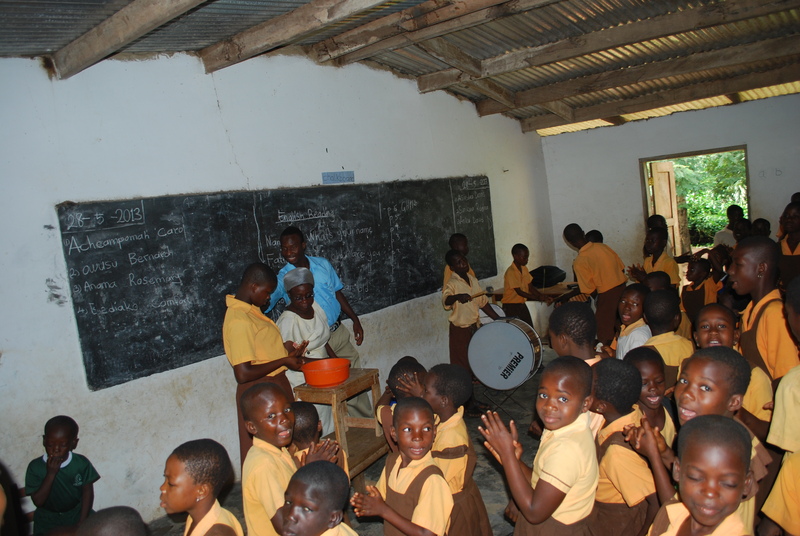 When we arrived at the school the children were singing, dancing and clapping to the beating of drums. I asked one of the teachers what the hoopla was all about; she told me that every Wednesday the children worship. It was very adorable and touching to see the children so excited to worship. 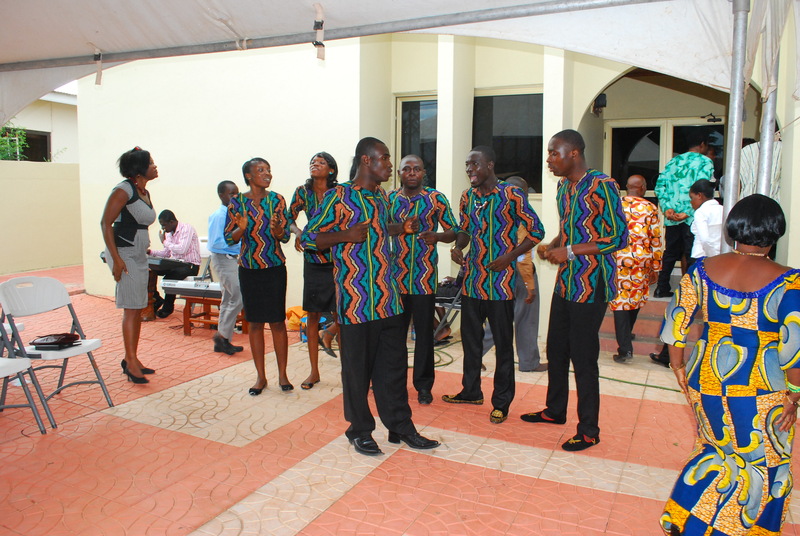 They then came out of the classroom to sing the Ghanian national anthem (and of course hugged us afterwards). 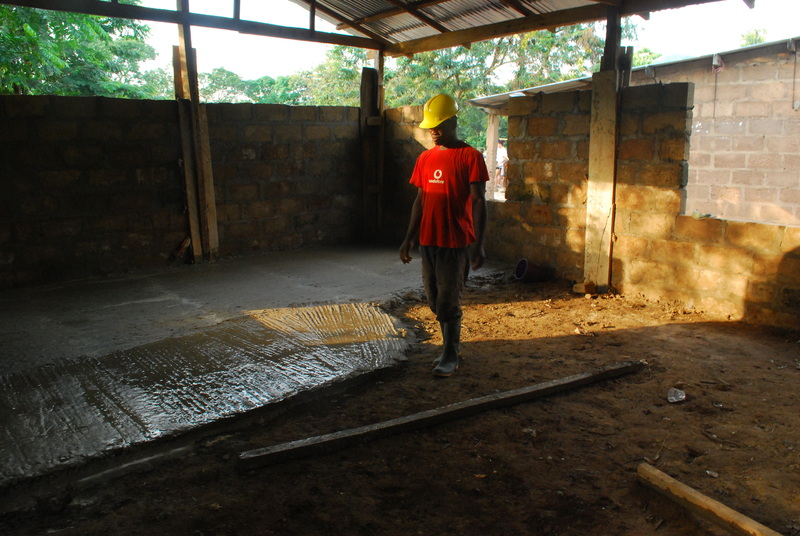 Once the masons arrived at the site, we started bringing the mortar over to finish the floor. 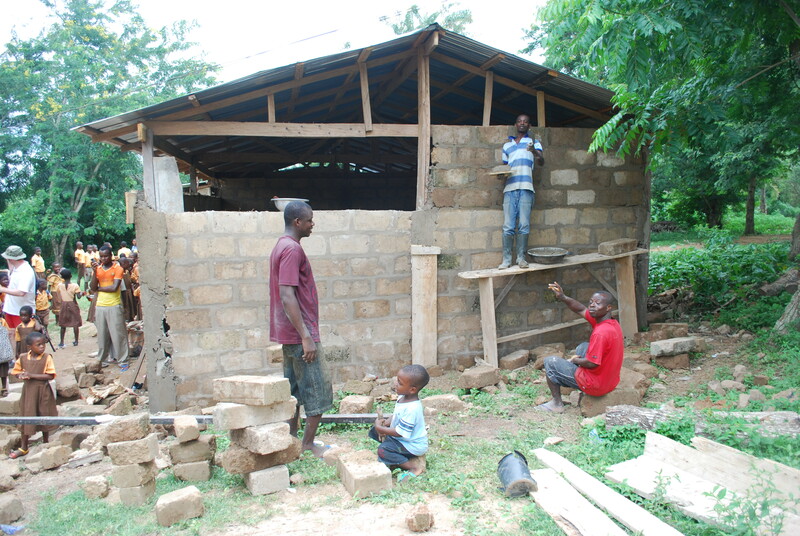 We then brought mortar over to put in the lintel (support above the windows and door frame). During a break I was sitting with one of the students in my lap while watched the other students run around the field. For some reason I felt very peaceful. At that moment I remember thinking how much I did not want to leave Worawora, let alone Ghana. 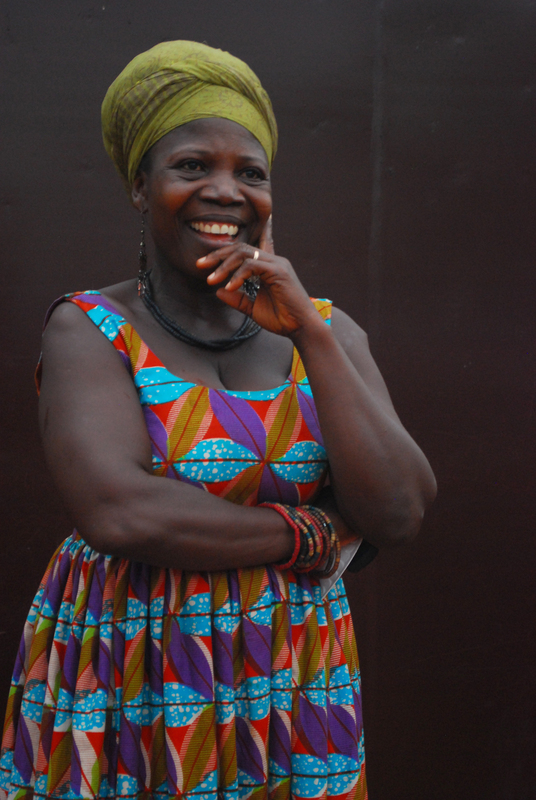 I became very attached to Worawora and the community. It was pure joy working with everyone. The term “obruni” became a term of endearment for the team. Derrick told us the project is 95% completed. The masons and carpenters just have to finish a little bit of the floor, repair a hole in the roof and place bricks on the front wall. We decided to work a half day on Thursday before we left for Accra. 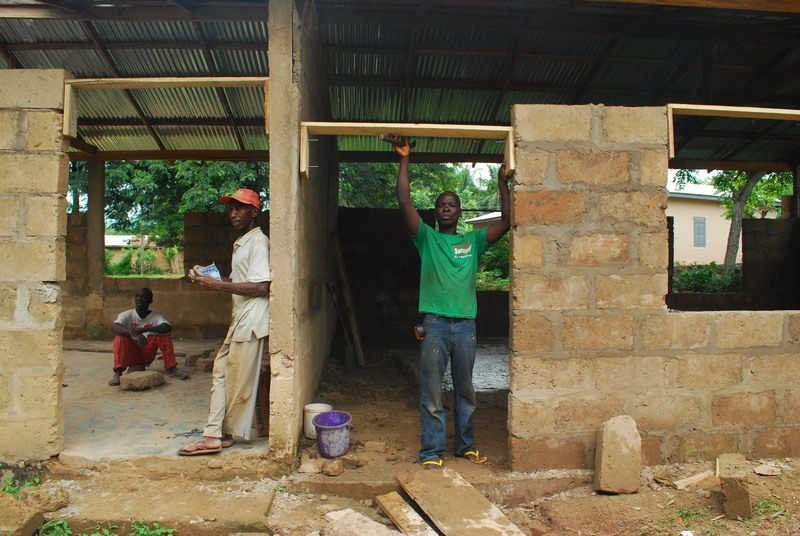 For the first part of the day we could not be of great assistance at the site, the masons and carpenters were doing more technical tasks. We went to the high school and proctored the school-wide history examination. We were supposed to ensure there was no cheating. I felt we were more of a distraction walking around, but everyone finished on time. After the exam, the students broke for breakfast at 9am. 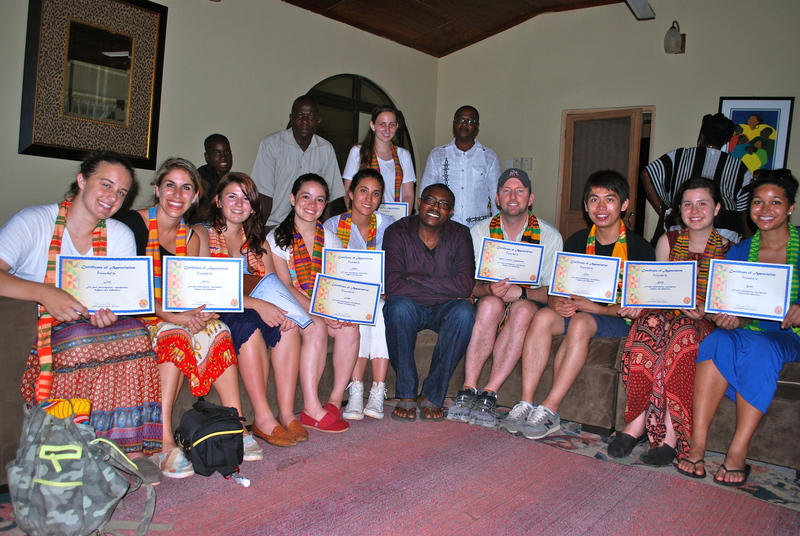 While they ate, we met with the Head Master, Joseph. He reminded me of Rafiki from the Lion King — very wise, a bit loony, and kind. He told us all about the education system of Ghana. He also shared with us his long educational past and how he became the Head Master. 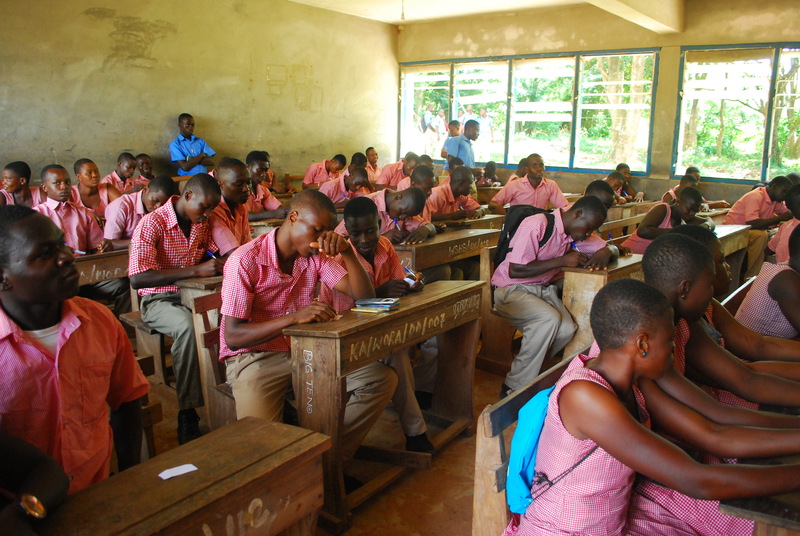 He has been the HM at the high school in Worawora since 2009. I was very interested in what he was saying, I just couldn’t keep my eyes open. I later found that almost everyone was struggling to stay awake, and most people were watching me nod out and then turn my head, smile and nod at the HM. When the students returned from their breakfast, we helped distribute the ballots for student council. It was a very serious task; all the ballots had the stamp of the school on them. We were given strict instructions only to collect one ballot from each student. There must have been severe cheating in the previous elections. 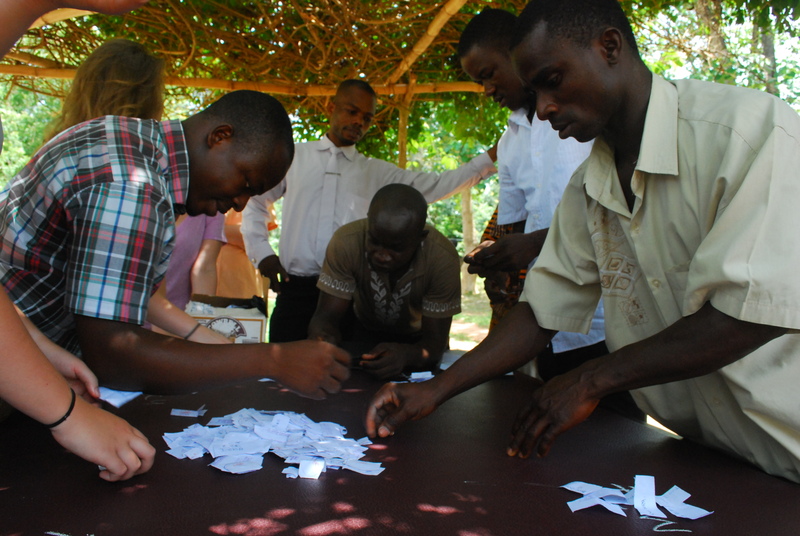 We then collected all the ballots and tallied them. Although it seems a trivial task, I felt honored to be part of something so important to the students. After a lunch of Ma Tess’ version of chicken nuggets, we went straight to work. 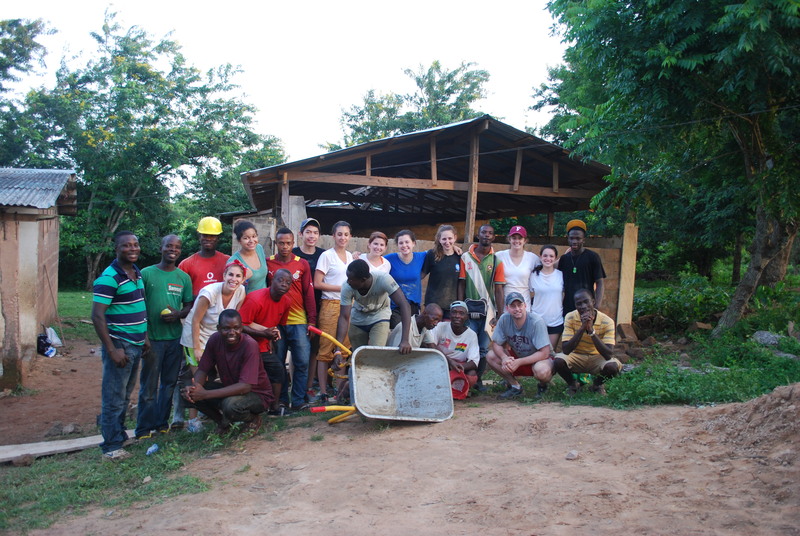 We continued making foundation for the floor — and we finished! All we had to do next was to smooth a layer of mortar on top. As per usual we read to the children at the library. While we were reading we could see lightning in the sky, but no rain as of yet. Finally towards the end of the session, one of the children said, “the rain is coming.” It sure did come. First we could hear the rainfall on the tin roof. The second the rain hit us, there was a village wide black out. There was complete chaos. I could not see my hand in front of my face, it was that dark out. I latched on to my team members and we were led by the children to the library. Once in the library, we could hear screeching tires as Chief, our driver was turning the car around to drive us home in the rain. The power did not come back on until 5am the next morning. Oy.